If you have seen our previous posts in this blog, you may have wondered how this GPRS hacks. And may be thought, Are these network operators so foolish? Anyway, here I'm going to explain you clearly how the GPRS hacks works and how you can also HACK Them. Yes! Now you can also hack them according to your need after reading this tutorial. I guarantee that you also can become a hacker after reading this. Many users have requested me to explain how GPRS hacks works and I'm tired of explaining all these things to everyone. That's why I'm creating this post. Actually It is not at all an easy task. It have no much difficult too. Just some knowledge and patience is enough!. So stop wasting time to search in the web and comment on some stupid blogs and request them to say how to hack. Just read below and you can do it.
. Anyway I will try my best to explain even the minute things as I can. Start reading below! This tutorial is for educational purpose only! Hacking is actually a crime. But understanding about hacking and utilizing the knowledge for good purposes are not crime (White hat hacking). So, start reading. As like every tutorial, this one also needs some requirements, and it is quite simple and easy to gather. Don't just hear whatever others say and just imitate it. Do it in your own way. Experiment, Try and you will succeed once. Use your brain effectively. Now we can start hacking. Before that, one thing to say. If you are reading this article from your mobile device, Better to switch to your PC. During reading you may have to go to some links, download softwares etc. In that case and also for comfortable reading, recommended to switch to your PC. Now take your mobile and open any browser you like and connect to Internet. Use only Direct browsers. Don't use browsers like Opera Mini or UC Browser. This is because these browsers uses special host servers so you cannot use it now (don't worry, I will explain it). You can use Browsers like Opera Mobile (Don't forget to turn off opera turbo in it. If you turn it on, you will be connected to Turbo's server. We don't want that), Dolphin browser (not dolphin mini) or your default browser that is already installed in your phone at the time of manufacturing. In some phones like Nokia C1-01, the default browser is Opera Mini and it doesn't supports Opera Mobile and similar browsers. In that case, don't worry. Still there is a hidden default browser in your device that can be only used to access the home page.I'm not going to explain about the hidden browser because the users are very less for those phones. I will explain if anybody requests in comments. It is a little bit tough too. How Opera Mini, UC Browser and similar apps works? Now I'll explain how Opera Mini and UC Browser works. They uses a special server for data compression and transmission. Usually it is server4.operamini.com for Opera Mini 4. It is mini5-1.opera-mini.net for Opera Mini 5 and above. For UC, servers are different. We cannot predict to which server they are connecting to. UC Browser with versions up to 8.9 connects to uc6.ucweb.com at first and then after loading the homepage for first time, they connects to another server. They have different servers from different countries. The Address to which they are connecting to cannot predict before installation and initialization of UC. Let's see how it works. If you enter an address to the Address bar and press Go, instead of connecting to the address, they connects to the server. Let me explain it with an example. Suppose we enters www.facebook.com and press Go in Opera Mini 4. Usually, in Opera Mobile and in PC, if you enter a address like this, it will connect to www.facebook.com's corresponding IP address (it is unique address that refers a computer in a network. Don't bother much about this) and send a GET request to send the web page. Thus we receives the web page as HTML code and the browser displays it for us. But in this case, Opera Mini connects to server4.operamini.com and sends the request to send the compressed page of www.facebook.com. Thus. Opera Mini server connects to www.facebook.com from their own server as our PC does and they gets the HTML page. The server then modifies it to fit the width of our mobile screen. Then they also compresses the images and sends to our Mobile. Our Opera Mini receives it and displays it in the screen. Thus it can perform faster. Actually Opera Mini does nothing. It is the server that does all the job for us. That's why size of Opera Mini, UC Browsers and similar apps are very less (usually less than 500KB). But Dolphin browser and Opera Mobile has size over 5MB. It has a lot of things to do. It does all the job the PC Browsers does. That's why it has that much size. As I promised, I will explain some technical terms you need to know before getting into hacking. If you already know this, you can skip this and get into next part. Proxy server is a service usually used to hide your IP Address. IP address is a unique 32-bit address that is assigned to every computer connected to internet. If you visit any web page, the owner of that user can easily know details of your IP address, your ISP, location etc. For masking your IP address, you can use a proxy server in your browser to connect to internet, thus you cannot be tracked by anybody. But We have another use with these proxy server for GPRS hacks. Before that, I will explain how this works. And Enter any address on the address bar. You'll notice that instead of going to the actual web page, it goes into the Proxy Server's Home page. There you can see another address bar. Enter any address there and see the address bar. You can see that wherever you navigates within the proxy page, your basic address is the same. That's what we want. Whenever we type an address in the address bar, the browser masks the address and sends request to the proxy. Say, you have entered www.google.com in the address bar. It loads the Proxy page. But the address will be still www.google.com in the address bar! Using the URL form inside the Proxy page, you can navigate to any site you want. You can download any files, watch videos etc. (Downloading and video support are depends on which proxy you uses. Some may not support these.). So, whatever you does it all seems to be from www.google.com. Thus the network provider think that you are browsing google. But actually you can browse anywhere on Internet! We can utilize this to hack for free Internet. I'll explain that in the later part of this tutorial. It is better to try this before going to next part. There is also another term related to Proxy, called Proxy Port. I'm not going to explain it because I'm sure that it is always 80 whatever hack you uses. So, just skipping that. Wherever you navigate in the Proxy page, the part of the URL, upto http/ will be same. That means, if you want to go to any other address, you can directly copy paste the Address upto http/ and enter your address there (check it out!). This is only an example of FrontQuery. There are many other FrontQueries other than CGI proxy. Many frontQueries have no need to have proxy settings. This is useful for many hacks and mods. There is no need to explain much about this. Just like FrontQuery. The difference is that the string is attached to back of the URL. There is no proxy settings or something like CGI Proxy for BackQuery. You will understand more about this when reading later in this post. I have almost explained about these earlier. The difference between Hosts and Proxy is that, when you use a host, the address which you refer (ie, the server address like server4.operamini.com) is masked by the address you used as host or realhost. RealHost is a special type of host itself. The main difference between them is when sending requests to the server. It's a little bit confusing. No need to worry about that. You will understand about this further in this post later. So, Now you know about Proxy, Server, Host, Backquery etc. 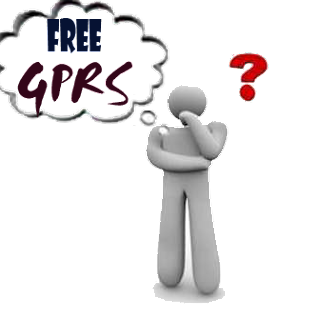 Now the question is, how to implement these on mobile to get free GPRS? We can use the inbuilt settings in mobile to use many of these. But, it is little bit confusing and time consuming. As a hacker, we need to continuesly change server address, Proxy etc. to check for free GPRS accessibility. So, we can use a Handler application. It is a special modified version of official ordinary apps like Opera Mini, UC Browser etc. 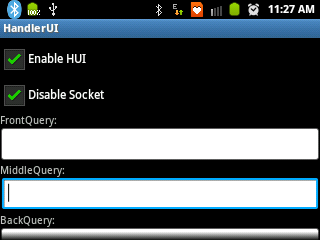 The difference is that there is a Handler UI menu in it, in which there are options to add Frontquery, Proxy etc. It can also change the server and do much more things. This is obviously a much useful app for everyone (Thank to Dzebb, founder of Handler apps). You can download Handler apps of many applications from HERE. There are also, Android, Symbian versions included. If you are connecting your mobile to PC, actually you have no need of a handler app. You can configure all of this in the browser itself. Still, if you want ,there is a handler app for PC. It won't have as much options as mobile handler apps have. It is a separate browser in which you can specify FrontQuery, Backquery etc. I don't recommend it as there is no need of such things in PC. You will understand more about this later on this post. fore we start hacking. Hope you understand this so far. Considering the length of the post, I have divided the complete post into 3 parts. Currently, the part 2 is under progress and will be published soon. Part 2 is more difficult to make you understand than this part. So, it needs more than a week to complete. Subscribe us Via Email to get the latest updates in your Email. Make sure you don't miss my future posts! doesn't this work for bsnl & vodafone....! We are still waiting for the part2,Keep it up:-) u are a great hacker? good work dude.. keep going..
Guys, I'm about to start work in part 2 of this series. Those who read this, give suggestions for topics to be included in part 2. How to create a new apn in android? Publish a post on this. That's basic i suppose.